Various different ​Beading techniques are available for you to play with, and you can often combine several techniques such as bead embroidery and bead weaving. ​Bead embroidery is a very organic form of beading; you have a lot of freedom with design, and can include many different elements. Because bead embroidery is the technique of beading onto a fabric backing, you do need to be careful about how heavy are the elements you include on each piece. However, with the right backing, support, and end-construction, even quite substantial elements can be incorporated into bead embroidery very effectively and still be worn very comfortably. ​Bead weaving requires precision of tension and pattern. Although this technique offers huge creative possibilities, it is best when the beads are of a consistent shape and size. Incorporating different shaped and sized beads is possible, and opens up interesting design variations, however the attention to weight, size, tension are key for a successful piece. Combining textiles with beading is at the heart of Haute Couture. Textile embellishment with bead embroidery is regarded as a pinnacle of textile techniques, requiring the optimal combination of beads, sequins, ribbons and other embellishments to achieve a glorious wearable Creation. Away from the high lights of the fashion world, the same techniques can be used by any of us to transform clothing, accessories and jewellery into our own Art Pieces. 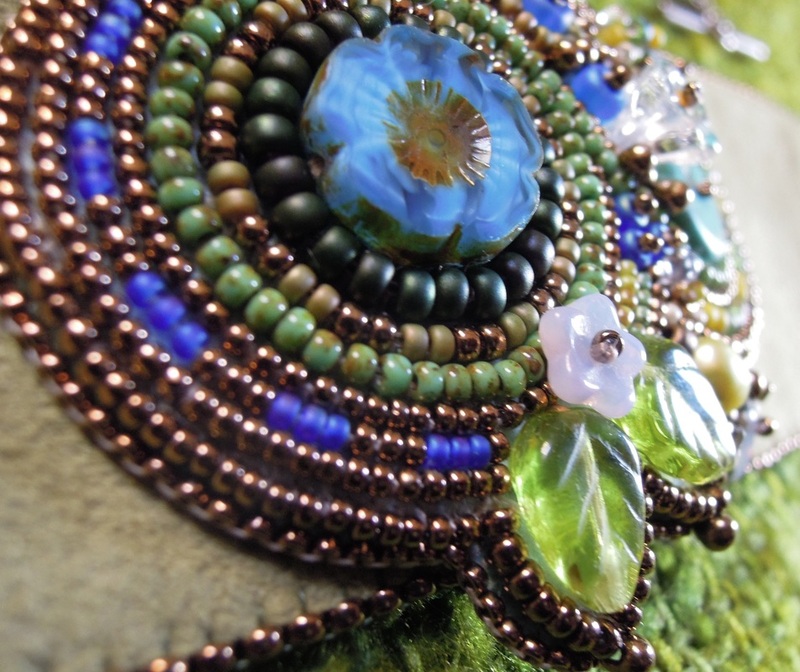 ​Anyone can learn beading, bead embroidery, and textile embellishment. Beautiful hand sewn and woven beading, made with sparkling Swarovski crystals, Czech glass beads, seed beads, pearls, semi-precious stones and vintage elements. Hundreds of glass seed beads and crystals, woven using a single needle and thread to make a soft and supple collar. Glass seed beads, glass leaves and flowers, and other elements such as pearls, semi-precious stones and charms can all be sewn directly onto a fabric backing to achieve a wonderful piece of textile jewellery, an accessory, or simply a piece of framed art. Printing beautiful images onto cotton, silk or other fabric, then beading onto and around the image using both bead embroidery and bead weaving techniques.